At the Olympic Games in October of 1968, two black men gave what was known as the black power salute while receiving their medals. Gold medalist Tommie Smith and bronze John Carlos made a stand for civil rights even while they were standing, mounted on the podium in front of the eyes of practically the whole world. When they received their medals they were wearing no shoes or socks, black gloves and civil rights pins while they each held a fist high above their heads. The fact that they were wearing no shoes was meant to represent the slavery and discrimination that African-Americans had lived through, and when they clenched their hands it represented how blacks stick together with such strength and unity. When they stood up on the podium during the national anthem, both had their heads bowed showing that the liberty and freedom of the song apparently did not apply to people of color. The whole International Olympics Committee was agitated. They were shocked that these two men would do this and had them both suspended and sent away from the Olympic Village. 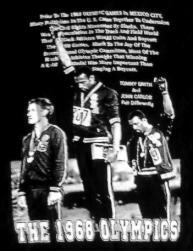 All of the angry and upset people didn't even recognize that there wasn't a hint of violence in what Tommie Smith and John Carlos had done. There was nothing that they had done wrong; neither of them had even said a word! As it was, when questioned later about the experience, Smith replied, "I have no regrets, I had no regrets, I will never have any regrets. We were there to stand up for human rights and to stand up for black Americans. We wanted to make them better in the United States."